I only post this because of all the recipes I found, none of them quite matched this one. It is an old and favorite dish of mine. It was the one my Mother made for me when I would eat nothing she placed in front of me. It is my father’s recipe. He said he got it from his mother, a lovely, lively woman of Pennsylvania Dutch ancestry. For that reason, I’d always thought the recipe was German. I’ve never had a formal recipe for this dish. I only make if from watching it having been assembled in front of me. Over the years, I’ve cooked it as a casserole in the oven or microwave. I’ve also simmered it in a large pot on top of the stove, and tossed it into a slow cooker to stew all day. All I can say is that all systems have worked equally well for me. The ingredients are simple. Shred a head of cabbage. Chop an onion. Open a packet of breakfast sausage. Assemble those ingredients in layers in your cooking instrument. Poor tomato juice over all until it tops the dish and cook. The only thing I’ve ever added to the above ingredients is a healthy dose of freshly ground black pepper. As you can see, it’s not stuffed cabbage, a dish I also love. But the dish is wonderful in its simplicity. Dad did say his mother used to hollow out an entire head of cabbage, stuff it with the above ingredients, and cook it all day. I’ve never done that, but feel free to try it. Let me know how it goes. Anyway, as you can imagine with fall knocking on my door, I have a pot of this currently cooking in the slow cooker. Love to all, and happy eating no matter what you’re making. I celebrated my tomato crop today. First, I had TWO tomato sandwiches for lunch. That’s freshly sliced garden-grown tomatoes on toast with salt and mayo. Oh boy! Then tonight’s salad was sprinkled with the first of my cherry and grape dears. What a splendid day. I only hope the heat breaks eventually so blossom drop will end and new tomato production begin. I’ve just posted the first draft of my first chapter in my latest novel: Murder at Troublesome Creek. Read it here. Hi, welcome to my “old blog.” I still garden, but my main interest has shifted to writing, hence my new blog: The Novel Corner. So if your interest is writing, I hope you’ll follow me over there. Thank you. My old dependables: that’s what I would call them if I gave them names. They all came from just one plant, which I bought when I moved into this house some fifteen years ago. I did nothing to earn them. They seeded and planted themselves. 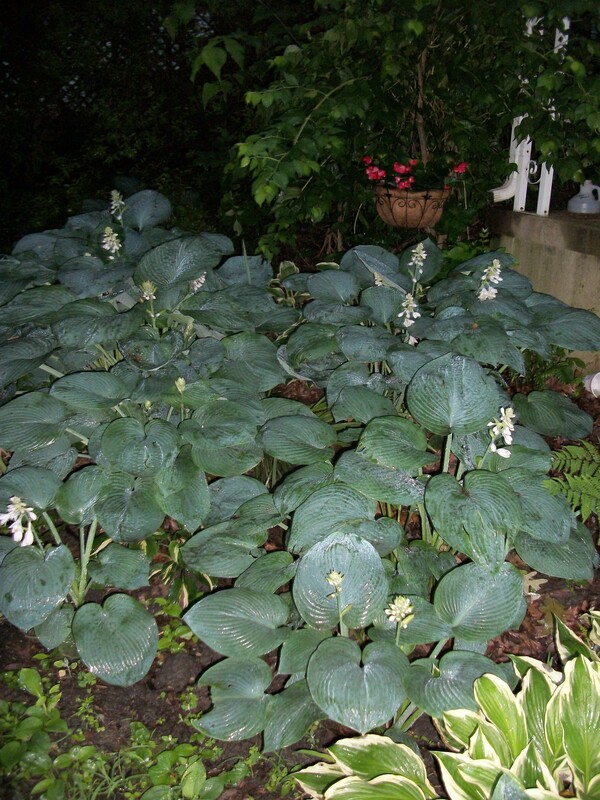 Perhaps I would better call them my determined hostas. In addition to this spot, they also line a fence in another part of the yard and grace my front doorway. They’re not my only hostas, but they are the only ones to have self-seeded themselves. They simply amaze me. What a cold snap we’re having. It’s to get down into the low 40s for the next three nights. Our high today only reached into the low 50s. If the Grinch stole Christmas, who the heck has made off with our spring? I’ve had a wonderful spring so far and am sure that I will enjoy it again once it returns. Most of the winter sown flowers are in their beds, and the veggies have been coming into my table. I love having fresh lettuce and radishes and spinach and green onions again. The Swiss chard is growing. Plus, I have four tomato plants out so far with plans to add three more to their list. That’s not a bad total when you consider that I garden in containers. Translation: that’s a lot of potting mix! Gardening is hope springing eternal. I love the fresh tastes of spring from my garden. I scrambled some eggs this morning, tossing in garlic chives, a green onion, and a few spinach leaves to round the dish out. Easy, pretty, and tasty. Last night, I sliced up a radish and its green with chives and garlic chives and mixed them into a teryaki stir fry. Their addition gave the punch that the dish lacks in winter. Now, I’m eyeing my peas awaiting their bloom. Spring, the world’s antidote to dull winter. ﻿﻿After growing veggies in pots last summer, I simply could not sit idle all winter. And the moment I learned about Winter Sowing, I knew I had to do it. 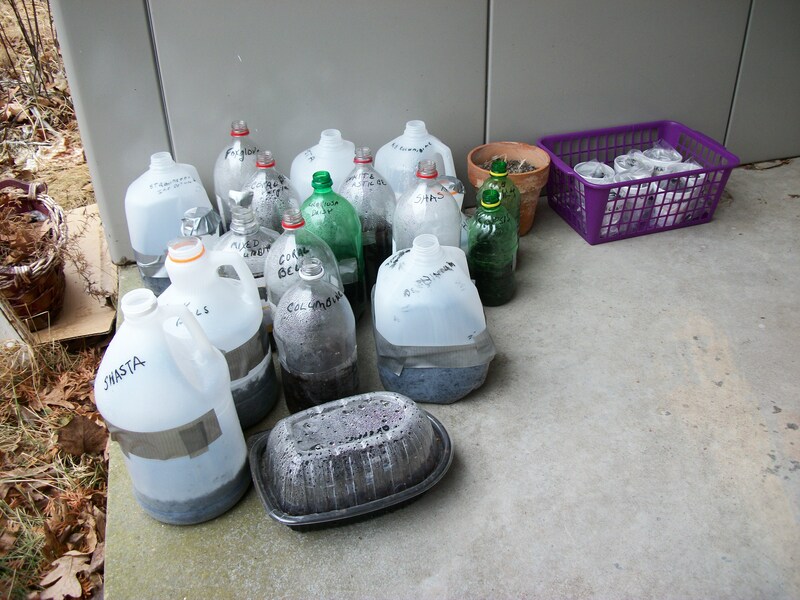 The goal of winter sowing is to start seeds in covered plastic containers — outside — in winter. The idea is the brain child of Trudi Davidoff. Details on how to do it are available at her website, Wintersown.org. But it’s the power of winter sowing that got me. For the price of some seeds, and some potting mix, the use of plastic milk jugs or pop bottles (begged, stolen, or borrowed), it’s possible to grow hundreds of beautiful bedding plants in one season. In all zones some plants self-seed themselves just fine from last year’s plants. With winter sowing you take those plants, mostly perennials and stuff tubs full with their seeds. Some Winter Sowers plant 100s of jugs. I’m already up to 33 containers, and I only intended to put out one dozen, at most. Plus,. I’m going to add more. So a warning is in order: Winter Sowing can be addictive. And at the Garden Web forum on Winter Sowing, the posters call themselves enablers, so beware. But it struck me the other day. If only twenty of my pots give me five plants each, I’ll have at least ﻿﻿100 plants to set out into the garden this spring. That’s what I see as the power of winter sowing. I don’t care how large a garden you have; it can fill quickly and inexpensively with beautiful plants by using this germination method. Of course my gardens are small. So I’ll have lots of plants to give away after they sprout. I’ve already warned relatives. They’ve kindly said that they’d take a few. I haven’t mentioned this to the neighbors yet, but they’re next on my list. But they must be wondering. Those jugs pictured above are sitting on my front porch. I also suffered sever angst the other day when the thought struck: next year I won’t have any gardening space to fill. But there will still be a need for new pots of herbs and vegetables. Thank heavens that need will go on year after year. And I suppose some of my flowers may not work out as planned or will be eaten by critters or something. So I may need to do new pots of those. That’s important. You see, besides being a wonderful way to start plants, Winter Sowing does a good job of chasing away winter blues. In the meantime, think SPRING! P.S. Not pictured in the above photo are Styrofoam cups planted with herbs. They’re also WS, using potting mix, Styrofoam cups, and sandwich baggies with a small slit in the top. The baggies are secured to the cups with a rubber band. Next month I plan to use the same method to WS tomatoes. 2010: How Did my Veggies Do? 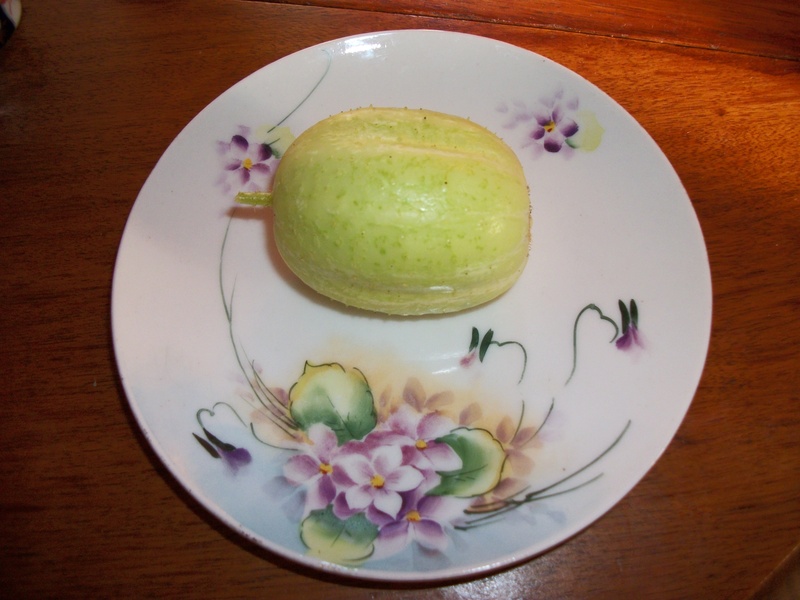 This year's winner: the lemon cucumber. Here it is, nearly the end of 2010, my first year as a container vegetable gardener. Looking back, I’d say I had far more success than I deserved. I knew nothing about veggie gardening at the outset of this effort beyond what I’d read in The Bountiful Container. Although the two authors, Rose Marie Nichols McGee and Maggie Stuckey packed a lot of knowledge into that lovely book, I still found myself sometimes scrambling to keep up with reality vs book learning — if I may say so. My fault, not theirs. There’s a lot to learn, I think, when undertaking any meaningful gardening, and although my patch of pots was small, I grew a lot of crops. I think my greatest producer was the lemon cucumber. Once those vines took off, they refused to acknowledge the word quit. I liked their flavor so well that I can’t bring myself to buy a boring, normal, super-market cucumber now that my garden’s “six-feet under” for the winter. Lemon cucumbers will be back next year, no question. The biggest surprise of the year came from the green beans. I hadn’t planted any early, and I drooled when I saw photos of other people’s green bean harvests. After a kind gentleman told me it wasn’t too late to grow some, I threw seeds into a bucket and got three wonderful bean plants which kept me in green beans for several weeks. I was in heaven. My biggest failure was zucchini, which I’d always thought anyone still capable of standing upright could grow. But I hadn’t heard back then of the borers who settle in and make mush of vines. I had counted on the plant to produce a “super abundant” crop from my tiny garden. I was seriously bummed. But overall, I had many more successes than failures: chard, with which I fell in love; beets, even if they only gave me greens; radishes, which I adore cooked, greens and all; onions; green garlic; and a very few, fragile looking, and delicious peas. In total, I was ecstatic with what I dragged forth from those few tubs. And I miss those crops now that their buckets are at buried under a blanket of snow. But the sun is heading north again. It’s winter-sowing season, and I’ll soon be caught up in that activity. And before I know it, the empty tubs and their waiting dirt will warm, and I’ll be out there every day, planting, watering, nurturing the most satisfying plants I’ve ever grown — vegetables. And all these years I thought I liked growing flowers. Not that I don’t still do that. Only now, I mix flower plants in with my veggies. Thank you McGree and Stuckey for the idea! And 2011? Bring it on! I’m sorry you’re not eating the mushroom quiche I am tonight. So sorry! Recipe here.